MTM Mission. Our mission is to manufacture and deliver products that meet the unique needs and expectations of each customer. To that end, we have successfully built a solid foundation and infrastructure for custom contract manufacturing. Turnkey Manufacturing. 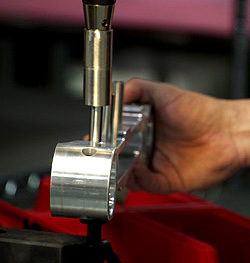 Located in Chelsea Industrial Park in Huntsville, Alabama, McAllister Tool & Machine, Inc. is one of North Alabama’s most progressive precision parts and assembly manufacturers with a focus on supplying turnkey manufacturing solutions in a timely and cost-efficient manner for our defense, aerospace, and commercial clients. Relationships are imperative in business today. Your success is our success - we make you part of our team: innovative, competent, dedicated, enthusiastic, and determined to manufacture and deliver products in a cost-efficient manner. MTM stays in tune with customer needs in terms of technology, quality, advanced capabilities, diversity, and project management. Small Company, Big Solutions. Although MTM is a small company, we provide big solutions to a variety of manufacturing challenges:. OEM's Need for Reliable Sources. 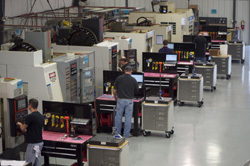 Original Equipment Manufacturers (OEM) are looking for reliable companies to whom they can outsource much of their production. By hiring a small but efficient company like MTM, they can better manage internal operations without having to invest in equipment and certifications. A small precision manufacturer like MTM can work efficiently, with flexibility, and provide higher quality products. A Relationship-based Strategy. Customers come to us with needs like timely delivery; process efficiency; quality control; and friendly customer service. MTM’s operational strategy is to cultivate relationships built on trust and an honest understanding of customer needs. Our value proposition lies in our ability to solve problems quickly and efficiently. Commitment to the Intrepid Fallen Heroes Fund. Over 75% of McAllister Tool & Machine’s production is for the defense industry and in support of the military. MTM contributes regularly to the Intrepid Fallen Heroes Fund and we plan to raise money for traumatic brain injury (TBI) among military personnel and veterans.